Despite the awful weather, last weekend’s GUKPT Manchester still attracted a substantial field of 241 entries. 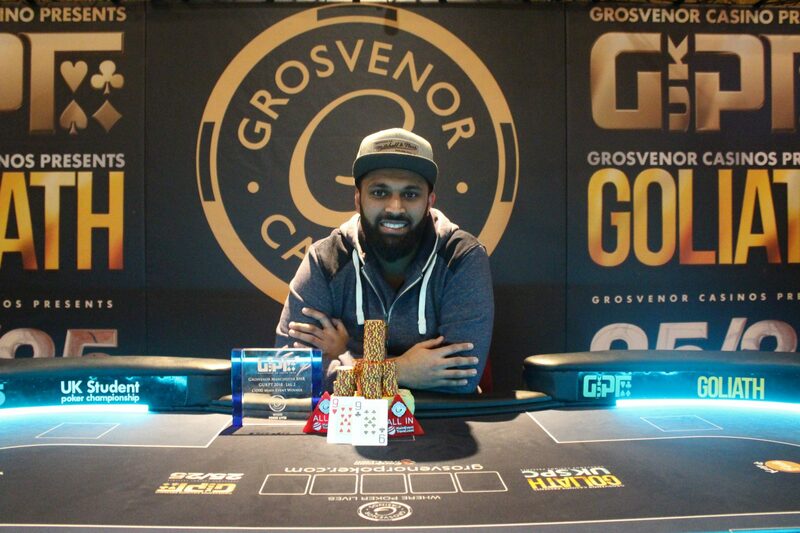 Adam Lulat was the champion, winning his first trophy and £68,930, by far the biggest cash of his live poker career. 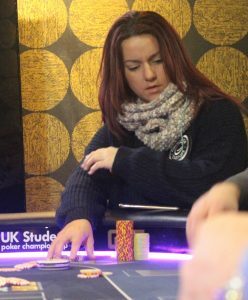 Lulat ousted Grosvenor Ambassador Katie Swift en route to victory on Sunday and was chip leader for most of the final table. The next GUKPT event is Leg 3 in Edinburgh starting April 22; we’re Official Travel Partner so let us help you book you a fabulous hotel in the Scottish capital. Swift finished in eighth place after a rivered 8 gave Lulat a set to Katie’s QQ. Katie won £6,020, her second cash on the tour this year; she also made the final of a side event at GUKPT London last month where her husband Dean was runner-up in the Main Event. Katie was originally planning to miss GUKPT Manchester last week because her son Jack was competing in an important football match on Saturday. However the inclement weather meant his match was cancelled. She added: “Ironically it was because of the snow that I played GUKPT Manchester & then snowmen ended it! Gutted. Cheers for messages. Couldn’t achieve any of it without love, help, support & belief of my family. In poker terms, they really are “the nuts”! Runner-up Gary Whitehead, who was third at GUKPT Blackpool last November and seventh at GUKPT Leeds in 2015, won £45,060. The £241,000 prize pool was divvied up between 23 players including Ben Dobson, Steve Warburton and new Grosvenor Passport winner David Gee. GUKPT Edinburgh runs April 22-29 at Grosvenor Casino Maybury. The £100,000 guarantee Main Event starts on Thursday, April 26.